After my Fetishists post, I was invited by Mike Seymour to join he and Jason on Red Centre to discuss in greater detail the points I raised. It was a welcome opportunity both to drill down on each of the specific issues, and to clarify a few things that some of the many comments seemed to miss—namely, that I chose my “fetishists” out of respect (so please, those of you with the pitchforks, put ‘em away), and that as crowd-pleasing as a “shut up and shoot” post can be, this actually wan’t meant to be one. The truth is, all your favorite filmmakers are fetishists, and you should be one too if you want your films to be their best. Technology and gear are not the first things I think about when I think about filmmaking, but they do tend to be the first things I blog about. If “none of the tech matters, just make a movie” was the end of the conversation then that would be the end of ProLost. Talking tech is great, and nobody does it better than Red Centre, so please subscribe if you haven’t already, and give a listen to episode 66. If you’d like to play the home game while listening, here are full-size stills of the image of Mike from the post, before and after color correction. 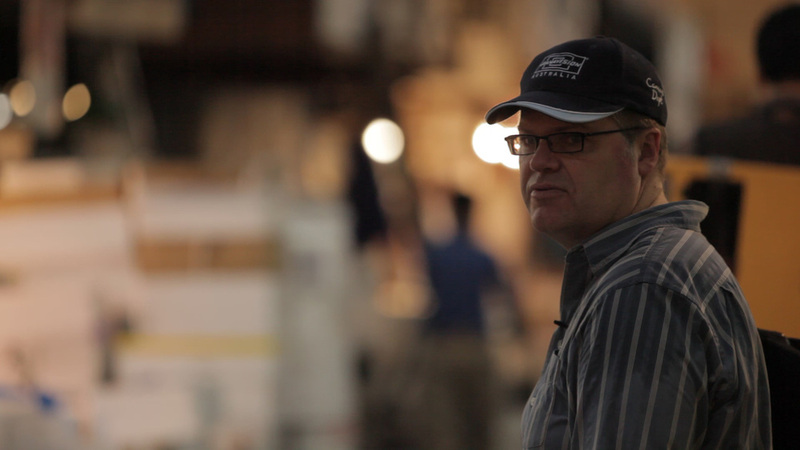 These stills are pulled from 5D Mark II footage I shot of Mike in the Tsukiji Fish Market in Tokyo, and you can decide for yourself if it’s compression, 8-bit-ness, or an insidious combination of the two that makes it tough to brighten Mike’s face. On the show Mike also mentioned that he’s embarking on a new fxphd DSLR Video course as a follow-up to the popular-but-aging session that he and I shot in Japan. This time, Mike has nabbed someone who actually knows what he’s talking about, none other than Tyler Ginter of the 55th Combat Camera Company. I look at a helicopter and think, “how can I put this in my movie?” Tyler looks at one and says “I think I’ll jump out of that with 90 pounds of gear strapped to me (including a 5D Mark II). Check out Tyler’s videos on Vimeo and stay tuned to fxphd for more updates. In my last post I made a barbed remark about the Sony NEX-VG10, based on early reports that it only shot 60i (NTSC) and 50i (PAL). Turns out it may actually have a progressive mode, which would make the PAL version an option for filmmakers in PAL countries, or those in the U.S. willing to jump through the 25/24 speed-change hoops like we old fogies once did with the first DV cameras. Personally, I’ll wait for real 24p, the importance of which Sony, unlike Canon, cannot pretend to be unaware. Now that so many camera manufacturers are fighting to give us DV Rebels exactly what we want, I won’t be expending any energy on cameras that don’t. And last but not least, if you’re not on Twitter, this might be a good week to start.